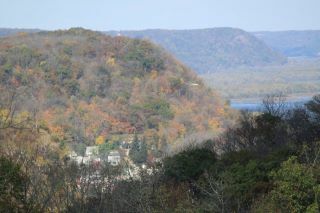 Mount Hosmer and Lansing Iowa from Eagle Ridge. Mount Hosmer is a bluff overlooking Lansing, Iowa. It is located directly adjacent to the Upper Mississippi River and offers a panoramic view of the river, including the Black Hawk Bridge. Mount Hosmer rises 450 feet above downtown Lansing. Accessible from Lansing, Mount Hosmer Park is a popular destination for photographers. According to a plaque inside the park, Mount Hosmer is named for Harriet Hosmer, a sculptor, who won a footrace to the summit of the hill during a steamboat layover during the 1850s. This 500 foot hilltop park of fifty-seven acres overlooking the Mississippi River constitutes one of the most striking war memorials in Iowa, being one which it would be difficult if not impossible to duplicate in any other city in the state. The Lansing park board, the American Legion post, and the citizens of the town have carried the memorial idea still farther and have planted in the park 634 white pine trees — one for each Allamakee county soldier, who served in the World War. On each tree a metal tag carrying the name of the soldier will be placed next year, when appropriate ceremonies will be held to dedicate the park to its enlarged memorial purpose. View the available property located at Eagle Ridge Country & Riverview Estates, Lansing Iowa.